How Far Back Can You Trace My Black Family? I have a lot of questions regarding my family's history. With my grandfather's recent passing, I was compelled to finally write in. My maternal grandparents, Woodrow Kimble Jr. and Martha Belle Kimble, were born and raised in Shreveport, La. My grandfather was born on Dec. 30, 1943, and died on Nov. 7 of this year. I know that my grandfather’s father was Woodrow Kimble Sr., son of Kingston and Georgiana Kimble from Campti, La. I believe that Woodrow Kimble Sr. served in the military during World War II. My great-grandmother’s maiden name was Logan, and her parents were Allen Logan and Katie Bush. I believe they were from either Campti, La., or Alexandria, La. First of all, please accept our condolences for the recent loss of your grandfather. During our research, we came across a Feb. 19, 1984, article in the Shreveport Times that revealed him to be a Baptist pastor who was very committed to his local community even when it faced hard times (as were two brothers who had answered the same calling). We also came across the obituary for Pastor Woodrow Kimble Jr. on the website for the newspaper, which confirms his birthdate of Dec. 30, 1943. When we began searching for records of Woodrow Kimble Sr., we located the marriage record for Woodrow Kimble and Martha Belle Logan on March 24, 1941, in Howard County, Ark. This record does not include their parents’ names, but it does provide their ages. According to it, Woodrow Kimble Sr. was born about 1920 and Martha Belle Logan was born about 1917. You noted that you believe Woodrow Kimble served in World War II. A draft registration card for Woodrow Kimble at Colfax, Grant Parish, La., states that he was born May 22, 1919. We believe this is your ancestor, but we would like to alert you to a close match that may come up in additional research that you may do on your own. While searching the 1940 census (the most recent year that is publicly accessible), we found a Woodrow Kimble born about 1919 in Mississippi who was married to a Gerthelee Kimble and residing in Heth, St. Francis, Ark. This did not seem to be a good match for what we know about your ancestor, though the age was close. This Woodrow Kimble registered for the draft at Heth, St. Francis, Ark., the same location of his marriage, and the record says he was born on May 18, 1919. These records confirm that there were two men named Woodrow Kimble born within days of each other, so you’ll want to be mindful of this when searching for more records. Examining the original record of your Woodrow Kimble Sr.’s World War II Draft Registration Card, you’ll note that it records his mother as Mrs. Joanna Redmon. This could be a variation of Georgiana, or it was incorrectly documented by the record taker. It also indicates that his mother was married under another surname. Some other clues can be gathered from this record. Woodrow Kimble Sr. registered on Oct. 16, 1940 and at the time gave his address as Route 3, Colfax, Grant Parish, La. He was employed by the L&A Railroad Co. at Shreveport, Caddo, La. This means that he was likely living in Grant Parish when the 1940 United States census was enumerated, though we still had difficulty locating him. It is possible that his name was transcribed incorrectly in the digital databases, so you may want to browse through the census for Grant Parish page by page to see if you can locate him. We searched other records of him to help learn more about his parents. According to the Social Security Death Index for Woodrow Kimble (subscription required), he was born in Colfax, La., the son of Kingston Kimble and Georgiana Bush. This is a good match for the information you have about the family. We then searched for information on Kingston Kimble and located a gravestone in Farenzie Cemetery, Colfax, Grant Parish, La. The stone records that he was born Oct. 23, 1878, and died Sept. 12, 1933. The date of death gives Georgiana a number of years in between his death and when Woodrow registered for the draft to have married. You can order the original death record through the Louisiana Secretary of State website. The Louisiana Death Index is available to search, and simply putting in Kingston Kimble to the search returns his death record in Volume 26, Page 10,434, with a link to print the order form. The original record may include his parents’ names, his place of birth, and his spouse or other informant to his death. We were also able to locate a few more records that are most certainly for the same Kingston Kimble, including a World War I Draft Registration Card that states he was born Oct. 22, 1876, and was living in Colfax, Grant Parish, La., when he registered on Sept. 12, 1918. He listed his nearest relative as Lizzie Kimble, but it does not state the nature of their relationship. We also located Kingston in Ward 6, Grant Parish, La., in 1900 with a wife, Ella, and a son, Matthew; so Kingston had been married prior to his relationship with Woodrow’s mother, Georgiana. In 1920, Kingston Kimball was still residing in Ward 6, Grant Parish, La., as a widower with his son, Oscar Kimball, who was only 12 years old. Your Woodrow Kimble was not in his household, though he should have been about a year old at the time of this record. We figured perhaps he was living in the household of his mother and his parents were not married at this time. It turns out that on the very next page of the census we noted a Woodrow Graves, who was 8 months old and was living with his mother, Georgiana Graves, who was 23 years old. It seems very likely that this is your Woodrow Kimble and his mother, Georgiana, and suggests that she was either married previously or was a single mother using the Graves name. The fact that his surname is different explains why we were having such difficulty locating Woodrow Kimble in census records, and is a good example of why it is always a good idea to check pages surrounding your family’s in census records. 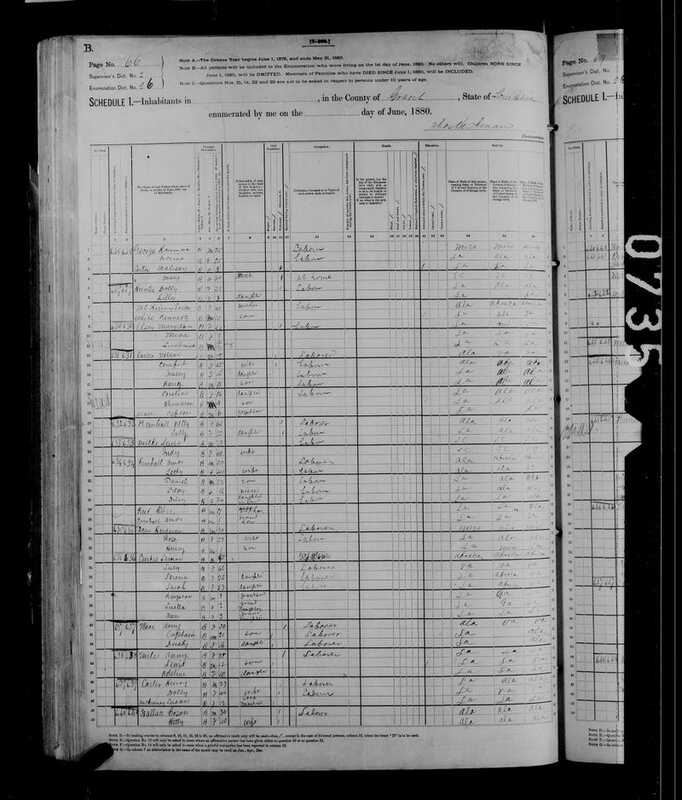 Since we were having trouble locating Woodrow Kimble Sr. in other census records, we tried looking for his mother instead, in case he was recorded under a different surname again. This allowed us to locate Woodrow Kimble living in the household of his stepfather, Primus Redman, in Grant Parish, La., in 1930. From this record, we determined that Woodrow’s mother, Georgiana, was born about 1896. Having her birth date will allow you to try to locate her in even earlier records. This record also provides you with the names of Woodrow’s siblings, including Davey Kimble, born about 1921, and Daisey Kimble, born about 1924 (likely full siblings, since they share the same surname); and O.C. Redman, born about 1927, and Lee Redman, born about 1928, who may be half brothers. Knowing when Georgiana was born allowed us to locate her living with her parents, Nash and Rachel Bush at Ward 6, Grant Parish, La., in 1910. Her birth date, place of residence and birthplace all suggest that this is the correct family. We were also able to locate her again 10 years earlier residing in the same place with her parents. This brings you back another generation by identifying the parents of Georgianna Bush and also gives you the names and ages of Georgianna’s siblings. If you have trouble working any further back, you can always research these individuals to see if you can find more information on Georgiana’s parents. According to the Social Security Applications and Claims Index for Georgiana Bush Watkins, who was born Jan. 27, 1897, at Colfax, La., her parents were Nash Bush and Rachel Whell. It states that a claim was made May 3, 1976. Interestingly, there is a gravestone for Georgiana R. Watkins born Aug. 27, 1897, and died May 7, 1991, at Farenzie Cemetery, Colfax, Grant County, La., that would be a good match for your Georgiana Bush. This is the same cemetery where Kingston Kimble was buried. You could continue to work backward in Georgiana’s line by searching for more records on Nash Bush and his wife, Rachel Whell. To try to search even further back for records of Kingston Kimble, if his death record does not include his parents, you will want to find records for him as a child. It seems likely that he was the Kingston Curtis recorded in the household of his grandfather Simon Curtis in Grant Parish, La., in 1880, because he is the right age and is the only person named Kingston recorded in this parish where we know the family was from. The family was also living close to a number of Kimball families, and it seems probable that Kingston’s parents were one of Simon Curtis’ daughters and a Kimball neighbor. Now, here is the most remarkable thing we found: The census record states that Simon Curtis was born in Africa in 1815, so if he is your direct ancestor, this brings this line back to the first ancestor that was brought to the United States! However, the date raised a red flag with us, since a ban on the international slave trade went into effect in America seven years before his alleged year of birth. As we have mentioned in previous columns, information in census records is based on what the census taker heard or was told by the household member relaying the information, and data such as ages, name spellings and other details frequently vary for the same person in different census enumerations. With that in mind, we checked the 1870 census and found a Simon Curtis living in Louisiana who was born in Africa and had family members with names matching the 1880 record, but his birth date was listed as 1799-1800—before the international slave trade was abolished in the U.S. It’s likely that this is closer to his actual birth date, though it’s worth noting that according to a review of the book Freebooters and Smugglers: The Foreign Slave Trade in the United States After 1808 in Civil War Book Review, Louisiana, where Curtis lived, was a focal point for that illegal slave smuggling in those early years of the ban, via the port city of New Orleans. We encourage you to search for more records of Simon Curtis and his family to determine when he was born and other details of his origins. Meanwhile, we hope that these new insights into your lineage bring some comfort in a time of sorrow.